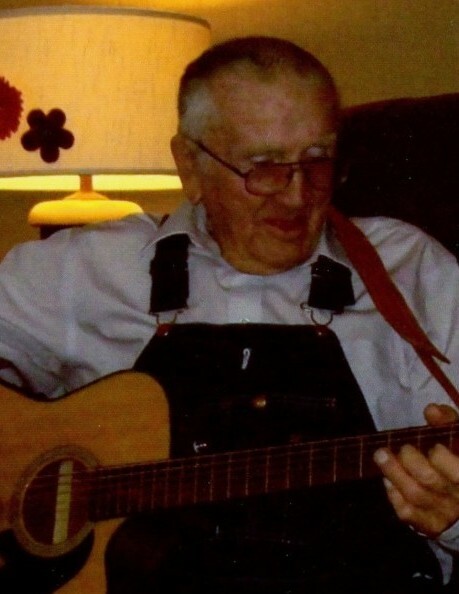 Logan Junior Tilley died January 20, 2019 in Ardmore, Oklahoma at the age of 91 years 9 months 5 days. Funeral Services are scheduled for 2:00 PM, Thursday, January 24, 2019 at Wadley’s Funeral Chapel. Interment will follow at Lexington Cemetery entrusted to the care of Wadley’s Funeral Service. Logan was born April 15, 1927 in Mountain View, Arkansas to Arlis C. And Iva B. (Powell) Tilley. He was raised in the Purcell area, attending Fairview Grade School. In 1945, Logan married Rosie Jones. Logan was inducted into the United States Army on May 2, 1946. He proudly served his country during World War II, being honorably discharged on October 8, 1947. Logan worked in the oil field in his younger years. He went to work for Tinker Air Force Base as a Machinist and retired in 1989. Logan enjoyed playing the guitar and singing. He loved spending time with his family, going camping, fishing, and going out on the boat at the lake. Logan is preceded in death by his parents, A.C and Iva Tilley; brother, Jesse Tilley; and a grandchild, Jamie Tilley. Survivors include his wife, Rosie; daughter, Linda George; son, Tommy Tilley and wife, Audrey; grandchildren, Amanda Randol and husband, Jason, Angela George, Troy Tilley and wife, Abby, Adam Tilley and wife, Kara; great grandchildren, Calum Tilley, Olivia Tilley, Cameron Randol, Brianna Randol, Aaron Tilley, Kassie Tilley; sister, Inez Feuerborn and many other relatives and friends.